Chile is a beautiful country with many cities close to the Pacific ocean. Viña De Mar is one such city. The translation of the name Viña de Mar means vineyard by the sea. You will understand why once you notice the popular Viña del Mar attractions that draw tourists from around the world. There are a variety of popular Viña del Mar attractions in and around the city. There is an art deco casino, several museums including a museum of fine arts and one dedicated to native villages, many fine restaurants and an abundance of shopping. However there are many places that are must-see stops on a visit to Viña De Mar. Here are a few of the attractions you might want to take special note of. 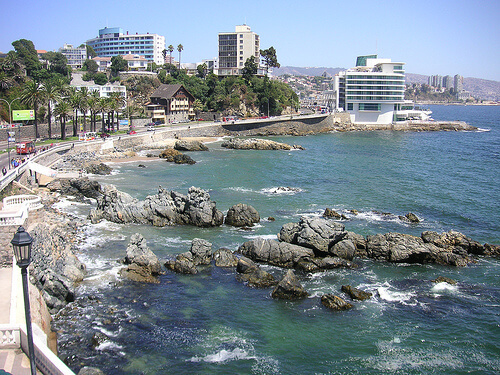 Reñaca beach is just five miles from the city of Viña De Mar. Along the route there are spectacular views of the water and small coves for swimming. Reñaca beach itself is a large and popular beach used by surfers. Those who enjoy nature will find a variety of beach views and will be able to watch seals at play. The seals themselves are a great reason to visit the beach. One of the things that makes Reñaca beach such a popular place to visit while in Viña de Mar is that the area is filled with great restaurants and shops that sell all types of trinkets. It is a great place to buy souvenirs. For those who are interested in history, architecture, or simply love castles, Wulff castle is a sight worth seeing. Built in the 19th century, this castle has a wonderful old round turret and a backdrop of the ocean. There is a doll display as well as ongoing art exhibits you can enjoy. And the views from the stairs are phenomenal. Many people enjoy visiting the castle because it is free and they can observe pelicans flying and standing on the rocks. For those who love nature and gardens, the Flower Clock of Viña de Mar is a sight worth seeing. This working clock is made up entirely of flowers and is best seen from a height to get the full beauty of this garden clock. The Jardín Botánico Nacional (National Botanical Garden) is large botanical garden teeming with many interesting plants and beautiful flowers. It is well worth a visit for those who enjoy quiet strolls and a beautiful atmosphere. Cerro Castillo, also known as castle hill, is where the president’s summer home is located. While you can only get close to this castle-like mansion once a year, the area is still worth visiting as there are many older homes with beautiful gardens to see. It is a delightful walk for those who love old homes and want to enjoy a bit of the city’s history. With all of these (any many more) Viña del Mar attractions, you shouldn’t get bored on your visit. Have you already been to Viña? What was your favorite thing to see? @Jamie – thanks for sharing your videos!